The public needs to hear how the food regulatory system ensures safety. 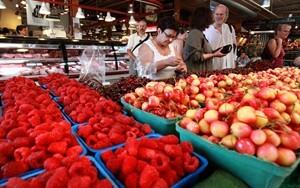 Ottawa—The federal government could provide an important assist to the agrifood sector as it prepares to launch its initiative to build public trust in the safety of Canadian produced foods, says Susie Miller, Executive Director of the Canadian Roundtable for Sustainable Crops. Miller, who was the facilitator for the Public Trust Steering Committee set up by the Canadian Center for Food Integrity and the Canadian Federation of Agriculture, said the government needs to start telling the public how well the food regulatory system works. “Canada has very strong regulations for food and environmental safety,” she told the Commons agriculture committee, which is studying the public perception of the agrifood sector and how trust in it could be enhanced. Statistics Canada collects considerable data on environmental farm practices that could contribute to the safety message, she said. “Not only will these results establish our environmental performance and compliance with parts of the code of practice that we are developing, it will help identify weaknesses for us so that we know where to focus corrective action. A home for the Public Trust initiative still has to be agreed on along with “a governance system so that all of the different commodities and all of the different players, processors, retailers and the general public are connected into this discussion as well,” he said.